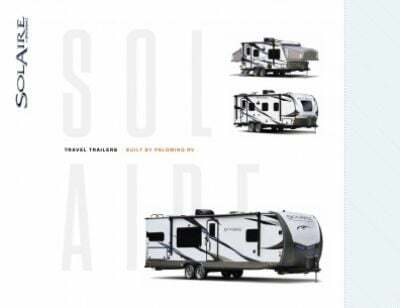 You'll love the comfort and style of the famous 2019 Palomino SolAire eXpandables 185X! This Hybrid Trailer is built for years of family adventures, from the local campground to far-away destinations! Stop by National RV Detroit to find this RV and other amazing models! We're located at 44700 N I 94 Service Dr Belleville Michigan 48111, so don't hesitate to visit us! If you would like to talk to our SolAire eXpandables experts, call us now at 734-439-3400! Once you've reached your destination, you can easily pop out the 15' 0" awning and enjoy some welcome shade and UV protection! This rig has a GVWR of 5630 lbs. and a hitch weight of 444 lbs. The slides maximize the living space in this 25' 11" long, 8' 0" wide Hybrid Trailer! The roomy kitchen has plenty of food prep and storage space, and the modern 3 burner cooktop will let you whip up delicious meals on the road, while the 8.00 cu. ft. refrigerator will keep everything cold and fresh! You'll be able to clean, drink, and cook with plenty of water from the 50 gallon freshwater tank!